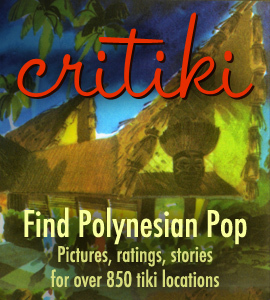 It’s been an exciting few days for my websites… this weekend, the How to Build a Tiki Bar post here on Humu Kon Tiki got a mention on Boing Boing (which is always a nice thing), and this morning, I woke up to the news that my tiki bar website, Critiki, made Yahoo!’s The 9. I actually had never heard of The 9, it’s a daily list of 9 sites that Yahoo! thinks are worth a mention, and they do so in a format that looks not unlike the TV Guide Channel. They show Critiki’s Spinning Globe of Tiki Goodness in the video, which is very cool, but for some reason they show pictures that are from Humu Kon Tiki instead of some of the actual photos in Critiki, which are generally as good or better. Go figure. They also didn’t spend enough time at either of those sites to actually get the tiki thing — they intro into the next site’s profile by saying something about watching sports at tiki bars (???). But I really shouldn’t look a gift horse in the mouth, it’s a wonderful thing for Critiki to be introduced to a new audience. Of all my sites, it’s the one that’s closest to my heart. Also, yesterday I got to meet some readers in the flesh, when they recognized me at a party. (It was such a treat to meet you!) That’s always extra-cool, and makes me feel less silly for having my picture on the site — it’s definitely worth it when readers are able to recognize me and come up and chat tiki with me. Hi, that was me that met you at the party. Nice to meet you! Ah, wonderful! Now I have a correct spelling to go with the face & name! It was great meeting you, Kathryn.